Pope Francis’ Easter message from the Vatican has urged for an end to the “carnage” in Syria. The pontiff also asked God to heal the wounds in South Sudan and the Democratic Republic of Congo, and urged dialogue on the Korean peninsula. He said the power of the Christian message gave hope to the deprived. Tens of thousands of people were in St Peter’s Square to hear the Pope speak from the balcony of the basilica. He said: “Today we implore fruits of peace upon the entire world, beginning with the beloved and long suffering land of Syria whose people are worn down by an apparently endless war. On relations between North and South Korea, Pope Francis said he hoped talks aiming to ease longstanding tensions on the Korean peninsula would “advance harmony and peace”. He also expressed hope for an end to violence and division in Ukraine and Venezuela. Pope Francis was speaking in an “Urbi et Orbi” address from the famous central balcony at St Peter’s Basilica at the Vatican, in front of tens of thousands of the faithful. The Vatican has ruled that bread used to celebrate the Eucharist during Roman Catholic Mass must not be gluten-free – although it may be made from genetically modified organisms. In a letter to bishops, Cardinal Robert Sarah said the bread can be low-gluten. However, the cardinal said there must be enough protein in the wheat to make it without additives. The new Vatican rules are needed because the bread is now sold in supermarkets and on the internet, the cardinal said. 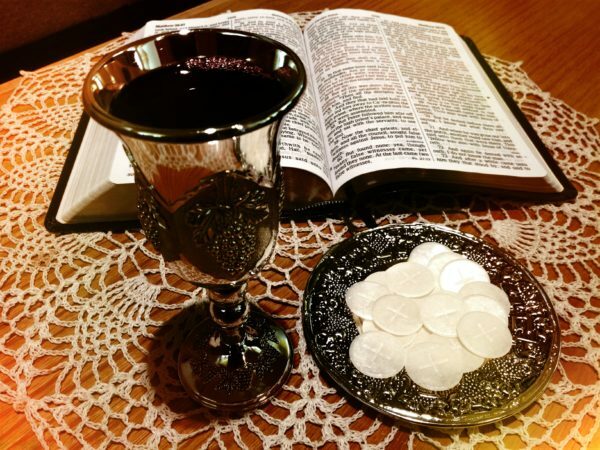 Roman Catholics believe bread and wine served at the Eucharist are converted into the body and blood of Christ through a process known as transubstantiation. Cardinal Robert Sarah of the Vatican’s Congregation for Divine Worship and the Discipline of the Sacraments said the wine used must also be “natural, from the fruit of the grape, pure and incorrupt, not mixed with other substances”. The Vatican letter said that the ruling was issued at the request of Pope Francis. There are about 1.2 billion Roman Catholics around the world. Pope Francis has said that is too early to judge President Donald Trump, but he warned against a rise in populism and the dangers of allowing political crises to usher in dictators like Hitler. In a wide-ranging interview with Spain’s El Pais, the pontiff condemned the use of walls and barbed-wire to keep foreigners out. Donald Trump has caused controversy with his comments on Mexican immigrants and his plans for a wall to keep them out. Asked if he was worried about the rise of populism in Europe and the US, Pope Francis said: “Crises provoke fear, alarm. In my opinion, the most obvious example of European populism is Germany in 1933. On President Trump, Pope Francis said he would “wait and see”. “I don’t like to get ahead of myself nor judge people prematurely. We will see how he acts, what he does, and then I will have an opinion,” the pontiff added. 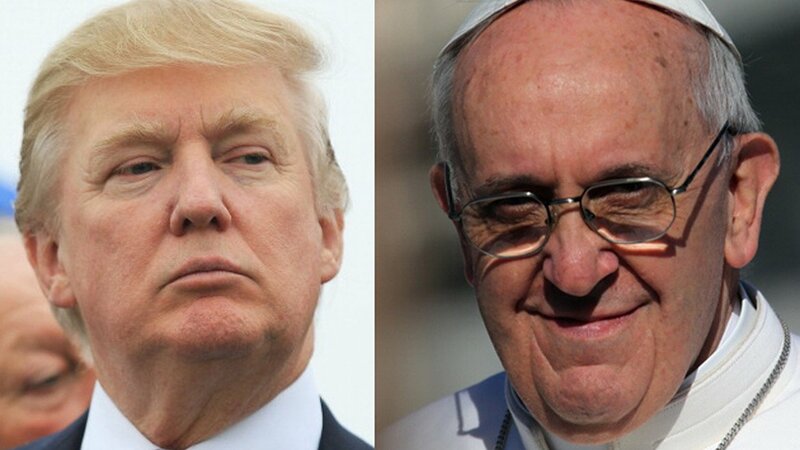 Donald Trump and Pope Francis publically disagreed during the presidential campaign, with the Pope appearing to question Trump’s Christian faith over his plans to build a border wall with Mexico. Pope Francis said the death of Fidel Castro was “sad news”, and that he was grieving and praying for his repose. Pope Francis met Fidel Castro during a visit to Cuba in September 2015. Fidel Castro was a self-professed atheist but as a child he attended Catholic schools in Santiago before going on to the Jesuit-run El Colegio de Belen in Havana. 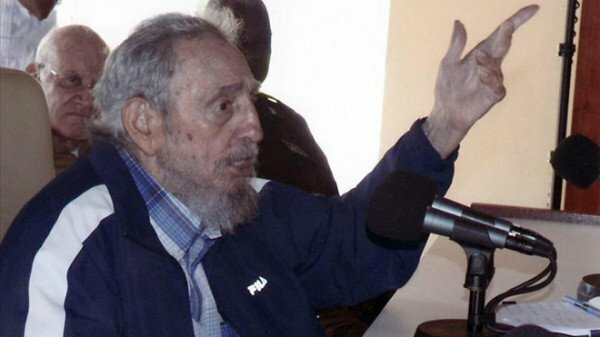 The former Cuban president and leader of communist revolution died on November 25 at the age of 90. Fidel Castro’s death was announced last night by his brother, Raul. In a surprise move, Venezuela opposition and the government are to meet for crisis talks, the Vatican says, after an intervention from Pope Francis. Protests have been held in recent days over the suspension of a referendum process seeking to remove President Nicolas Maduro. The move came after Nicolas Maduro met Pope Francis in an unannounced visit. The Vatican and regional bloc Unasur will mediate in the talks. Pope Francis “urged [the parties] to show courage in pursuing the path of sincere and constructive dialogue”, the Vatican said in a statement. After meeting representatives from both sides, the Vatican’s envoy to Argentina, Emil Paul Tscherrig, said “a national dialogue” had already started. He said they had agreed to formal talks on Sunday on Margarita island in the Caribbean. Nicolas Maduro said “at last” dialogue could begin. The head of the opposition coalition, Jesus Torrealba, who met Emil Paul Tscherrig, said while talks were important “it can’t continue to be a strategy for the government to win time”. 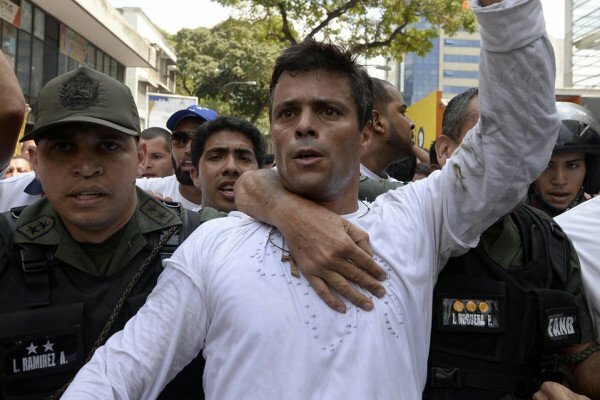 Another top opposition figure, Henrique Capriles, dismissed the announcement as a diversionary ploy. “No dialogue has begun in Venezuela,” he said. Nicolas Maduro, a former bus driver and union leader, is blamed by the opposition for Venezuela’s dire economic situation. The oil-rich country is facing widespread food shortages and spiraling inflation. The opposition is trying to hold a recall referendum that would allow Nicolas Maduro to be removed from office but electoral authorities suspended the process last week. The official reason was allegations of fraud during the gathering of signatures for the first petition required to enable the referendum. However, opposition lawmakers have long accused the National Electoral Council of being under the government’s control. In an emergency session of the National Assembly on October 23, they approved a resolution accusing Nicolas Maduro’s Socialist government of engaging in “an ongoing coup d’etat”. The Organization of American States also said it was “profoundly worried” by the electoral authorities’ decision. Hundreds of students protested on October 24 in San Cristobal, a city near the Colombian border. Nationwide protests are planned for October 26. Nicolas Maduro has accused the opposition of having links to foreign states, the US in particular, and of seeking to overthrow him to “lay their hands on Venezuela’s oil riches”. Mother Teresa has been declared a saint by Pope Francis in a ceremony at the Vatican. 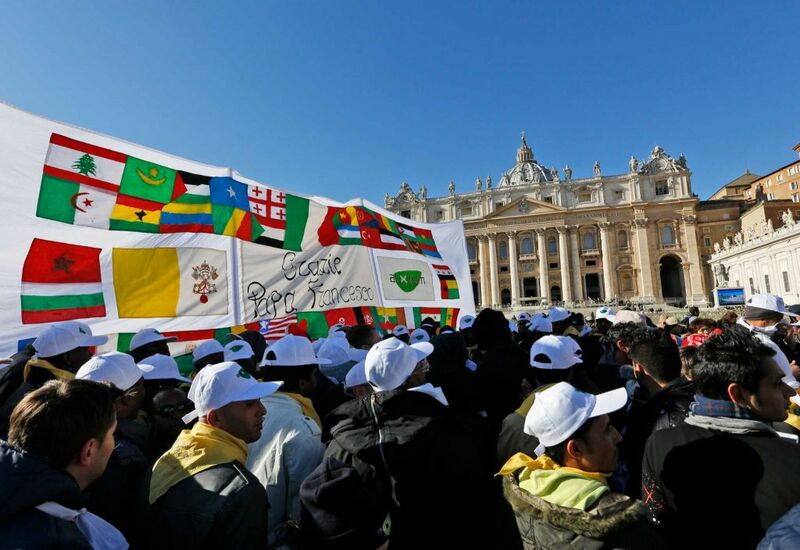 Tens of thousands of pilgrims had arrived at the St Peter’s Square for the Mass and canonization. Two miraculous cures of the sick after Mother Teresa’s death in 1997 have been attributed to her intercession. In 2002, the Vatican ruled that an Indian woman’s stomach tumor had been miraculously cured after prayers to Mother Teresa. Pope Francis cleared the way for sainthood last year when he recognized a second miracle attributed to Mother Teresa. Meanwhile in India, a special Mass was celebrated at the Missionaries of Charity, the order Mother Teresa founded in Kolkata (Calcutta). 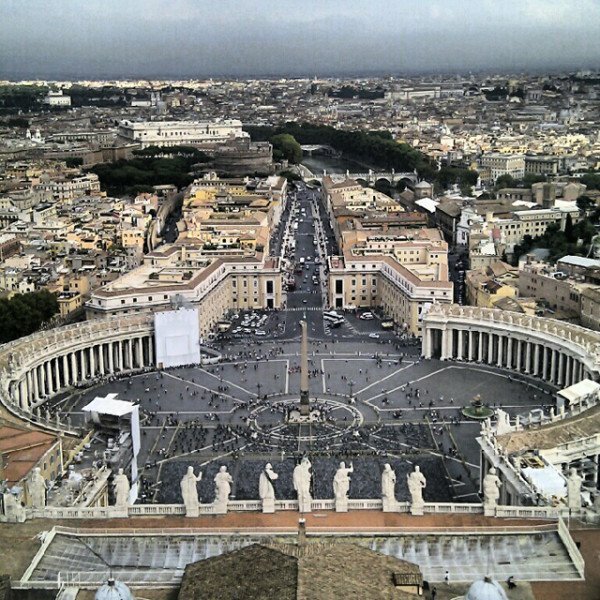 Many pilgrims arrived at the Vatican before dawn on September 4 to get a good spot among the masses for the ceremony. Cardinal Angelo Amato read a brief biography of the nun’s work, then asked the Pope to canonize her in the name of the Church. Some 1,500 homeless people across Italy were also brought to Rome in buses to be given seats of honor at the celebration – and then a pizza lunch served by 250 nuns and priests of the Sisters of Charity order. Nobel Peace Prize winner Mother Teresa founded a sisterhood that runs 19 homes. She died in 1997 at the age of 87 and was beatified in 2003, the first step to sainthood. Her work complements Francis’ vision of a Church that serves the underprivileged. Mother Teresa’s canonization is a centerpiece of his Jubilee Year of Mercy. Mother Teresa is to be declared a saint at a ceremony in the Vatican on September 4. Tens of thousands of people are expected to attend the ceremony led by Pope Francis in St Peter’s Square. Mother Teresa was famous for working with the desperately poor in India. 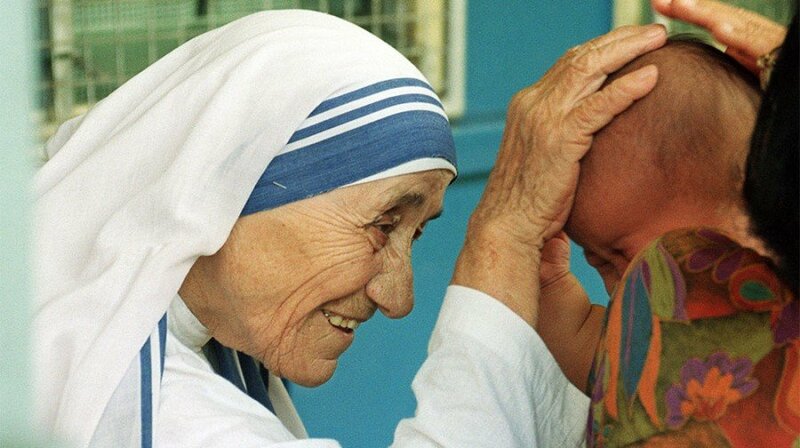 In India, there will be ceremonies at the Missionaries of Charity, the order the Nobel Peace Prize winner founded in Kolkata (Calcutta). Pope Francis will celebrate a Mass and Canonization in St Peter’s Square at 10:30 local time. Many pilgrims arrived at the Vatican before dawn on September 4 to get a good spot for the Mass. Some 1,500 homeless people across Italy are also being brought to Rome in buses to be given seats of honor at the celebration – and then a pizza lunch served by 250 nuns and priests of the Sisters of Charity order. Mother Teresa founded a sisterhood that runs 19 homes. 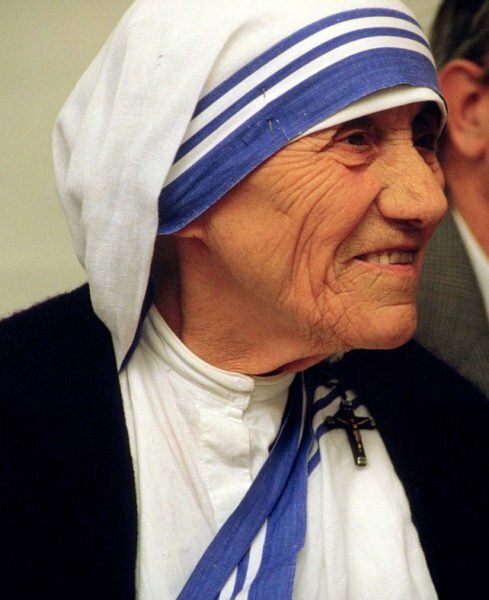 However, Mother Teresa was not without her critics, as some people noted a lack of hygiene in the hospitals run by her sisterhood, and said she accepted money from dictators for her charity work. Mother Teresa died in 1997 at the age of 87 and was beatified in 2003, the first step to sainthood. Pope Francis cleared the way for sainthood in 2015 when he recognized a second miracle attributed to the nun. Born in 1910 to ethnic Albanian parents as Agnese Gonxha Bojaxhiu, she grew up in what is now the Macedonian capital, Skopje, but was then part of the Ottoman Empire. At the age of 19, she joined the Irish order of Loreto and in 1929 was sent to India, where she taught at a school in Darjeeling under the name of Therese. 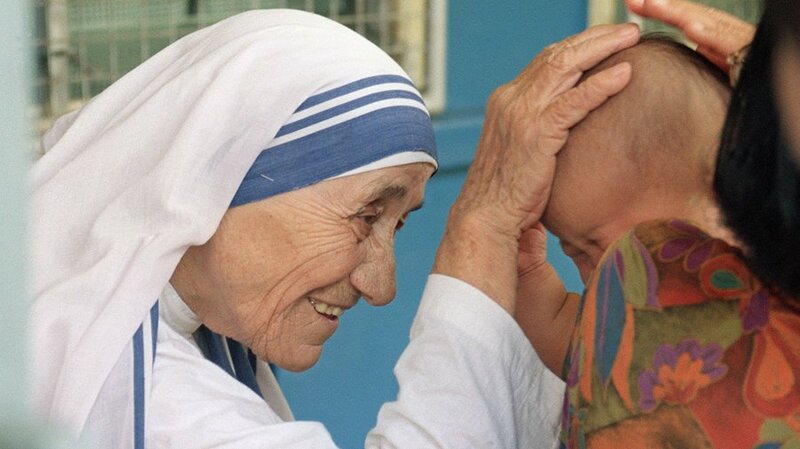 Mother Teresa founded the Missionaries of Charity in 1950. The sisterhood now has 4,500 nuns worldwide. She achieved worldwide acclaim for her work in Kolkata’s slums, but her critics accused her of pushing a hard-line Catholicism, mixing with dictators and accepting funds from them for her charity. It often takes decades for people to reach sainthood after their death, but beatification was rushed through by Pope John Paul II. Pope Francis was known to be keen to complete the process during the Church’s Holy Year of Mercy, which runs to November 2016. Twelve Syrian refugees have been taken to the Vatican by Pope Francis after visiting a camp on the Greek island of Lesbos. The three families, including six children, are all Muslim and had their homes bombed during the Syrian war. According to a Vatican statement, Pope Francis wanted to “make a gesture of welcome” to the refugees. Thousands of migrants are now stuck on Lesbos after last month’s EU-Turkey deal to try to ease the flow. All of those leaving with Pope Francis were already living on Lesbos before the deal was implemented, the Vatican said. They were reportedly selected from lots drawn, and will be looked after initially by the Sant’Egidio community, known for their charity work. Under the EU-Turkey agreement, refugees arriving illegally on the Greek islands from Turkey after March will be deported unless they successfully claim for asylum. In return, for every Syrian returned to Turkey, the EU will take another Syrian directly from Turkey. Pope Francis earlier told migrants living in the Moria camp – some of whom are facing being sent back – “you are not alone”. About 3,000 people are being held in the camp on Lesbos, some of whom lined the streets with banners pleading for help as Pope Francis arrived. Some wept, others threw themselves at his feet or chanted “freedom”. In his speech, Pope Francis acknowledged “the great sacrifice” the people in the camp had made, saying he wanted to “draw the attention of the world to this grave humanitarian crisis”. Greek PM Alexis Tsipras, who also met Pope Francis, said the visit “sends a message that surpasses Greece’s and Europe’s borders”. 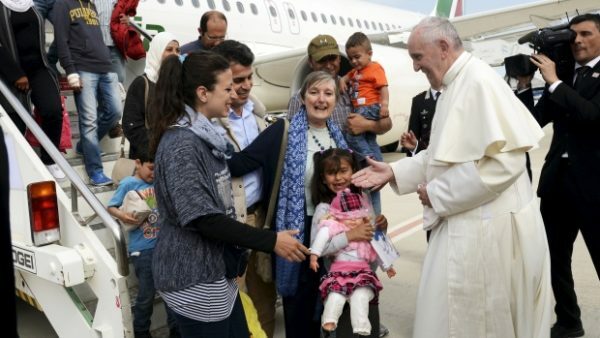 The Vatican has stressed the Pope’s visit was purely humanitarian and religious in nature and should not be seen as a criticism of the deportations. In September, Pope Francis made space in the Vatican apartments for two refugee families, urging Catholics across Europe to play their part to resolve the crisis. Bernie Sanders has been invited to the Vatican by Pope Francis, his campaign announced. 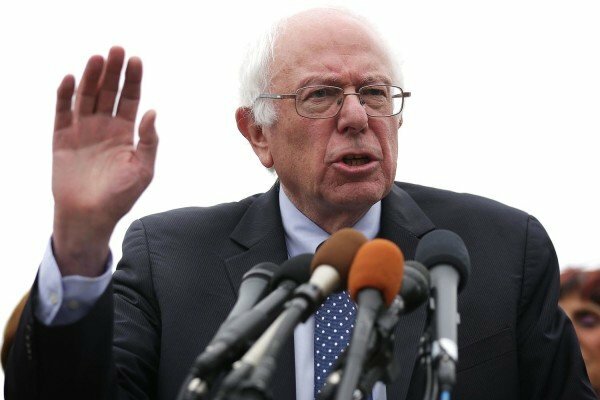 The Vermont senator and Democratic presidential hopeful, who is Jewish, accepted an invitation to Rome for a conference at the end of next week. Bernie Sanders’ visit to the Vatican is four days before the primary contest in New York, a competitive battle between him and front-runner Hillary Clinton. The Democratic presidential hopeful said he was not sure whether he would meet Pope Francis but he was a big fan of the pontiff. He will attend a conference on social, economic and environmental issues and give a speech on April 15, his campaign said. Bernie Sanders and Pope Francis have similar views on fighting income inequality and he was “very moved” by the invitation from the Vatican. He said he and the pope disagree on women’s rights and gay rights, but Pope Francis has “injected a moral consequence into the economy”. Bernie Sanders is trailing Hillary Clinton but gaining momentum after a string of wins, most recently in the Wisconsin primary. In the last few days, a mostly civil fight between the two became more personal as Bernie Sanders accused Hillary Clinton of not being “qualified” to be president. Pope Francis said on April 8 that the Catholic Church should be less strict and show more compassion to “imperfect” Catholics. The pontiff called on the Church to be welcoming to gay Catholics but did not change the Church’s views on LGBT families and marriage. Pope Francis has urged the Church to show more understanding of modern realities as he published new guidelines on family life. The document, based on two Synods on the issue, was eagerly awaited by the world’s 1.3 billion Roman Catholics. Entitled “The Joy of Love”, it does not change Catholic doctrine. The document opens the way for bishops in each country to interpret doctrine to suit their own culture. Pope Francis urges priests to exercise careful discernment over “wounded families” and be merciful, rather than judgemental. The pontiff criticizes the individualism that has led many in the West to value their own personal satisfaction over the needs of their spouse. While saying yes to s** education, he argues it must be within a framework of education about love. The emphasis throughout is on better pastoral care: better preparation for couples on what marriage involves, and more understanding from parish priests and others for human frailty. The document is the culmination of three years’ work by Pope Francis, who sent a questionnaire to families across the world asking them about their hopes and their fears. Pope Francis then brought bishops and cardinals together for two Synods in Rome, at which he encouraged them to debate and even to disagree over issues that divide the Church in many countries. Among the most divisive issues are offering communion to the divorced and remarried, contraception and the treatment of gay Catholics. Liberals had hoped he would tell the Church to show a more merciful attitude to those whose families do not conform to the current Catholic ideal. Conservatives had maintained it would devalue the principle established by Jesus of marriage being indissoluble. At the conclusion of the 2015 Synod, Pope Francis castigated Church leaders who, he said, buried their heads in the sand over the issue. He argued that their adherence to rigid doctrine was over-riding their concern for the suffering of families. 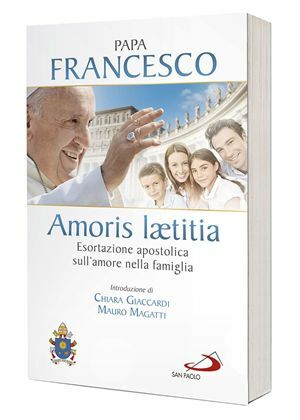 The document, formally known as a papal exhortation, has been trending worldwide on Twitter under its Latin name, #AmorisLaetitia. In another development, US presidential hopeful Bernie Sanders announced he would attend a conference at the Vatican on April 15. It was not immediately clear if he would meet Pope Francis himself. Pope Francis has called on Christians not to let fear and pessimism “imprison” them as he delivered his Easter message. The Pope’s message followed a condemnation on March 25 of the Brussels terror attacks. Islamist violence is expected to be a prominent theme of his traditional “Urbi et Orbi” Easter message. Many pilgrims cancelled their planned trips to Rome in the wake of the violence in Brussels, but St Peter’s Basilica in the Vatican was packed when Pope Francis celebrated mass on March 26. 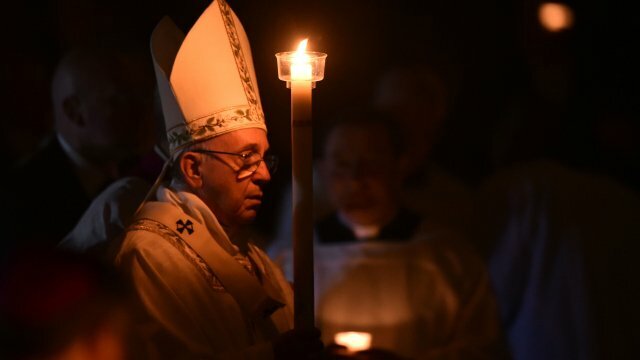 Pope Francis entered a darkened basilica with just a single candle guiding him. As he reached the altar, the basilica’s floodlights came on to symbolize the resurrection of Jesus Christ. The lengthy vigil service also included a papal baptism for 12 adults hailing from China, South Korea and other countries around the world. On Easter Day, Francis will preside over Easter Mass and offer his annual Easter blessing. On March 25, he denounced the “terrorist acts committed by followers of some religions which profane the name of God and which use the holy name to justify their unprecedented violence”. Meanwhile, Vatican officials distributed sleeping bags to 100 homeless people. The police presence in the streets around the Vatican has been stepped up this year, as more pilgrims than usual are expected after Pope Francis declared a jubilee year for the Catholic Church, calling it a “Holy Year of Mercy”. According to a recent opinion poll, Pope Francis is more popular than any political world leader. The WIN/Gallup International poll indicates that Roman Catholics and Jews have the most favorable opinion of Pope Francis. More than half of the world’s protestants and even the majority of atheists and agnostics view the pontiff favorably. About 1,000 people were questioned in 64 countries. Pope Francis was most popular with Roman Catholics, of whom 85% said they had a favorable opinion of him, and among Jews questioned the figure was 65%. Among the 64 countries polled, the Philippines was the most enthusiastic nation with 93% thinking favorably of the Pope. Pope Francis’s lowest ratings came in Tunisia, Turkey and Algeria, while most people in Azerbaijan said they did not know much about him. 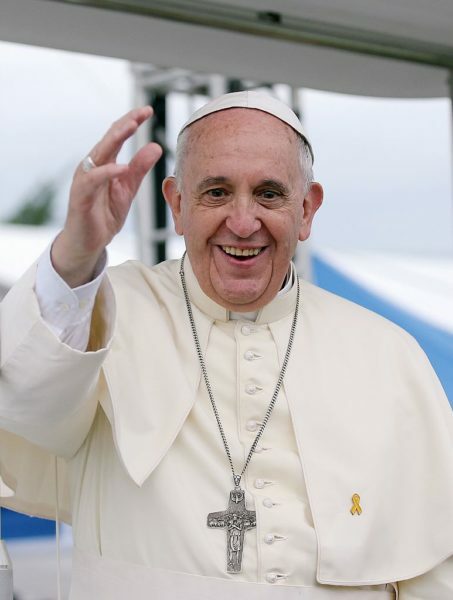 WIN/Gallup said that Pope Francis heads the rankings when compared to the global popularity of political world leaders. The poll gave the Pope a net score – the difference between favorable and unfavorable opinions – of +41 ahead of President Barack Obama on +30; German Chancellor Angela Merkel on +13; UK PM David Cameron on +10 and French President Francois Hollande on +6. Pope Francis gained 10,000 followers within hours after joining Instagram on March 19. 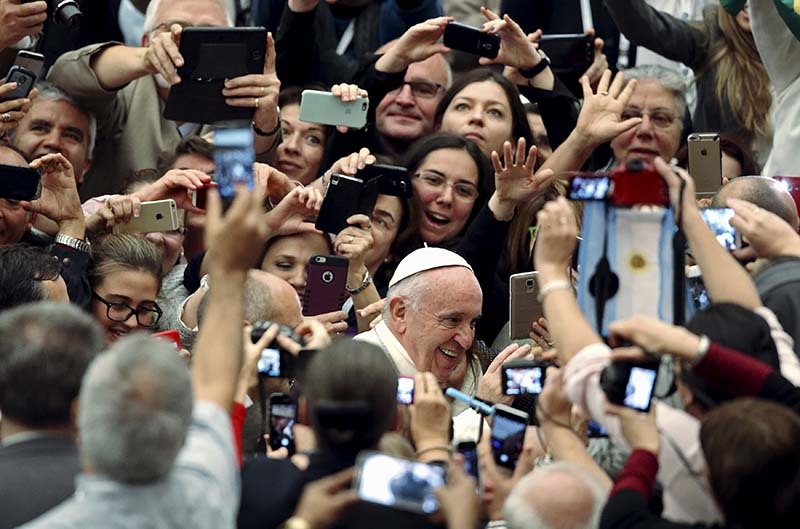 The Pontiff has only posted two photos so far but there are an estimated 1.2 billion Roman Catholics in the world. Pope Francis is using the name @Franciscus, Latin for Francis. 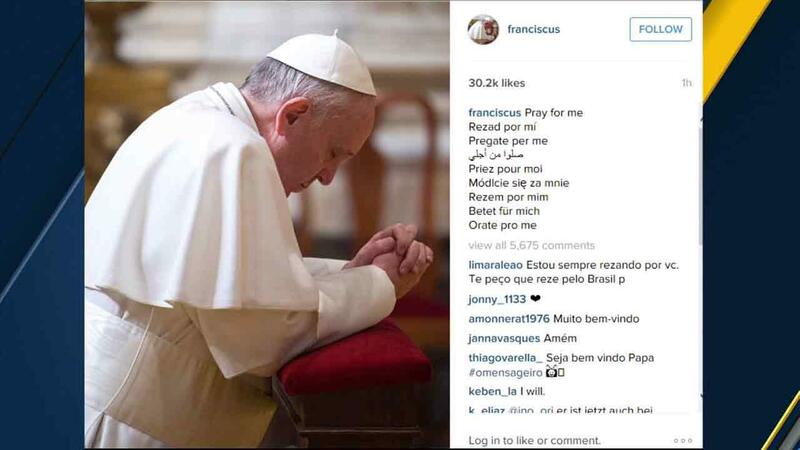 The first photo wasn’t a selfie, it was a picture showing Pope Francis kneeling with his head bowed in prayer. The accompanying caption reads “Pray for me” and is repeated in eight other languages. The Instagram account won’t be maintained by Pope Francis himself – other people within the Vatican will be responsible for the content. Pope Francis is no stranger to social media, he already has a Twitter account using the handle @Pontifex. He used that to announce his presence on Instagram. It’s thought the Vatican is trying to engage with younger Catholics through the use of social media. He explained that it was “to enable all those who wish to accompany and know more about Pope Francis’ pontificate to encounter his gestures of tenderness and mercy”. Instagram chief executive and co-founder Kevin Systrom met up with Pope Francis earlier this month. Mother Teresa is to be declared a saint on September 4, Pope Francis has announced. The Roman Catholic nun who worked with the poor in the Indian city of Kolkata (Calcutta) founded a sisterhood that runs 19 homes, and won the Nobel Peace Prize. Mother Teresa died in 1997 – aged 87 – and was beatified in 2003, the first step to sainthood. Born in 1910 to Albanian parents, Agnese Gonxha Bojaxhiu grew up in what is now the Macedonian capital, Skopje, but was then part of the Ottoman Empire. At age of 19, Agnese Gonxha Bojaxhiu joined the Irish order of Loreto and in 1929 was sent to India, where she taught at a school in Darjeeling under the name of Therese. In 1946, Mother Teresa moved to Kolkata to help the destitute and, after a decade, set up a hospice and a home for abandoned children. Mother Teresa achieved worldwide acclaim for her work in Kolkata’s slums, but her critics accused her of pushing a hard-line Catholicism, mixing with dictators and accepting funds from them for her charity. Pope John Paul II judged that the curing of Bengali tribal woman Monica Besra from an abdominal tumor was the result of her supernatural intervention. A Vatican commission found that her recovery had been a miracle after the Missionaries of Charity said that the woman had been cured by a photo of the nun being placed on her stomach. The finding was criticized as bogus by rationalist groups in Bengal. In December 2015, Pope Francis recognized a second miracle, which involved the healing of a Brazilian man with several brain tumors in 2008. The man’s identity was not disclosed but the man was said to have been cured unexpectedly after his priest prayed for Mother Teresa’s intervention with God. Donald Trump praised Pope Francis hours after the pontiff questioned his Christian faith. Pope Francis had said Donald Trump’s proposal to build a wall on the US border with Mexico was not Christian, provoking a strong response from the businessman. However, hours later, at a town hall event in South Carolina, Donald Trump was more conciliatory. The Republican presidential hopeful leads the South Carolina polls and he took to a stage in Columbia on February 18 to answer questions on national television. When asked about his row with the Pope, Donald Trump said he wouldn’t describe it as a fight, although he later said he didn’t like fighting with him. Donald Trump said the pontiff was misinformed when he criticized the proposed wall, because he was not aware of the drugs coming in and the other security problems that made a strong border a necessity. Earlier in the day, Pope Francis said “a person who thinks only about building walls… and not of building bridges, is not Christian”. That was roundly condemned by Donald Trump, who issued a statement in which he called the comments “disgraceful”. Donald Trump’s anti-immigration stance is a central plank in his campaign – he wants to deport 11 million undocumented migrants and said Muslims should be temporarily barred from coming to the US. The row with Pope Francis comes two days before Republicans in South Carolina and Democratic voters in Nevada will choose their presidential candidates. Donald Trump, who has no political experience but won in New Hampshire, is the clear frontrunner in February 20 Republican vote. At the town hall event on February 18 hosted by CNN, Donald Trump backed down from comments made at the weekend when he said President George W. Bush lied about the existence of weapons of mass destruction before invading Iraq. Pope Francis has questioned Donald Trump’s Christianity over his call to build a border wall with Mexico. The pontiff said “a person who thinks only about building walls… and not of building bridges, is not Christian”. Donald Trump supports deporting nearly 11 million undocumented immigrants. Calling himself a “proud Christian”, the Republican presidential hopeful blamed Mexico for the Pope’s remarks, calling them “disgraceful”. Donald Trump Trump has alleged that Mexico sends “rapists” and criminals to the US. The Pope declined to say whether Americans should vote for Donald Trump, who is leading the Republican race for president. “I say only that this man is not Christian if he has said things like that. We must see if he said things in that way and I will give him the benefit of the doubt,” he said. Addressing a rally in South Carolina, Donald Trump responded to Pope Francis’ comments. “For a religious leader to question a person’s faith is disgraceful. I am proud to be a Christian,” Donald Trump said. “[The pope] said negative things about me. Because the Mexican government convinced him that Trump is not a good guy,” Donald Trump added. He also said the Vatican was ISIS’ “ultimate trophy” and that if it attacked, “the Pope would have only wished and prayed that Donald Trump would have been president because this would not have happened”. 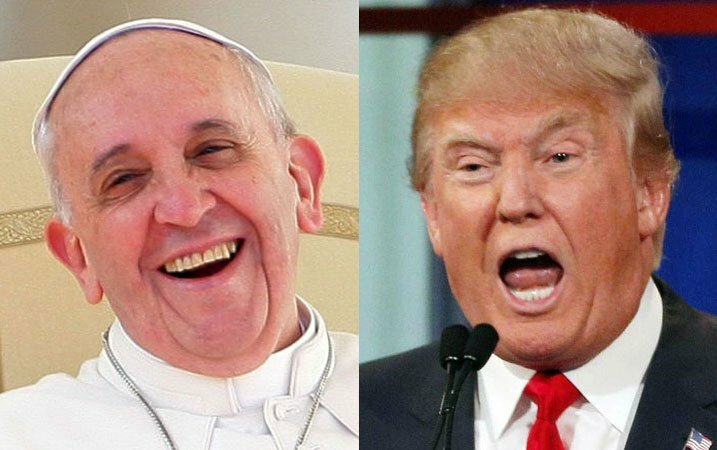 Donald Trump’s Republican rivals, Marco Rubio and Jeb Bush, both Catholics, said they look to Pope Francis for spiritual guidance, not political direction. Marco Rubio said the US has a right and an obligation to control its borders. Jeb Bush told reporters he “supports walls where it’s appropriate” and that “Christianity is between he and his creator. I don’t think we need to discuss that”. Earlier this month, Donald Trump called Pope Francis “a very political person” in an interview with Fox News. “I don’t think he understands the danger of the open border we have with Mexico,” he said. American Catholics are seen as an important voting bloc in US elections. Many support Republican candidates because of their opposition to abortion and gay marriage. Donald Trump has been courting the evangelical Christian vote, often successfully, but his fellow Republican rivals have tried to argue that his religiosity is not sincere. Ted Cruz’s campaign is now running an advertisement featuring a 1999 television interview Donald Trump gave in which he said he was “very pro-choice” when it comes to abortion. In January, Donald Trump faced ridicule after flubbing a Bible verse when giving a speech to a Christian university in Virginia. 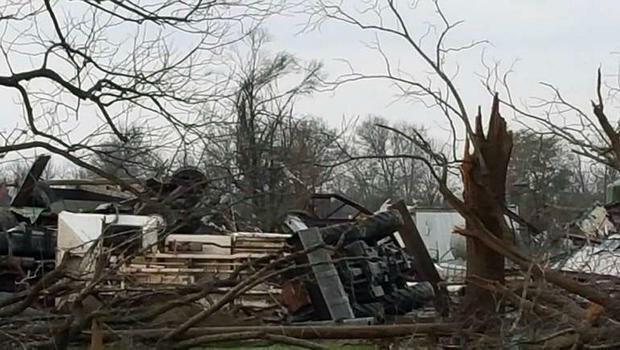 He has said he is a Presbyterian Christian but has had trouble recalling his favorite Bible verse when asked. Donald Trump has referred to communion, the Christian sacrament signifying Jesus’ last supper, as having “the little wine” and “the little cracker”. Pope Francis has met Russian Orthodox Patriarch Kirill at Havana airport to hold historic talks. Both leaders have called for restored Christian unity between the two churches. The meeting was the first between a Pope and a Russian Church head since the Western and Eastern branches of Christianity split in the 11th Century. In a joint declaration, Pope Francis and Patriarch Kirill also urged the world to protect Christians from persecution in the Middle East. The two-hour talks took place during Pope Francis’s stopover on his way to Mexico. Patriarch Kirill is visiting Cuba, Brazil and Paraguay. The two leaders embraced and kissed each other at the start of the meeting on February 12. “I’m happy to greet you, dear brother,” the Russian Church leader said. At a news conference after the meeting, Patriarch Kirill said the discussions were “open” and “brotherly”, while Pope Francis described them as “very sincere”. “We hope our meeting contributes to the re-establishment of this unity wished for by God,” their joint declaration said. 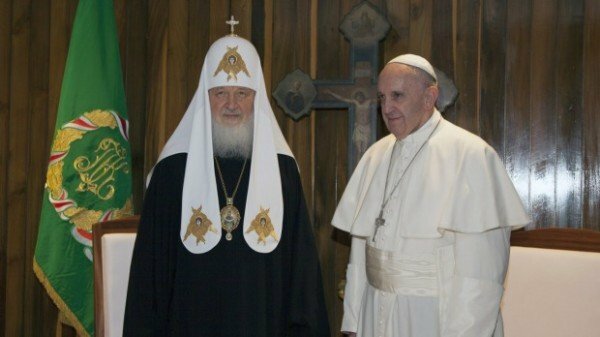 Patriarch Kirill has been the head of the Russian Orthodox Church since February 2009, while Pope Francis took up his role in March 2013. The Roman Catholic Church has more than a billion members worldwide, while the Russian Orthodox Church numbers about 165 million. The Russian Church is the largest and most powerful in the Orthodox faith, which is made up of a number of separate churches. Vatican has ties with Istanbul-based Ecumenical Patriarch of Constantinople Bartholomew I – nominal head of Eastern Orthodox Churches, but Cuba talks is the first between a Pope and a Patriarch of Russian Church. The Russian Church is the largest and most powerful Church in Orthodoxy. Cuba was reportedly chosen as the place of their first meeting because it is far from Rome, Istanbul and Moscow with all their historical baggage of schism. Pope Francis will meet the head of Russian Orthodox Church, Patriarch Kirill, in Cuba next week. The Russian Orthodox Church said the “persecution of Christians” would be the central theme of the historic meeting. Pope Francis will stop over in Cuba on his way to Mexico. It is the first papal meeting with a Russian Church head since the Western and Eastern branches of Christianity split in the 11th Century. The meeting is due to take place at Havana airport, where Pope Francis and Patriarch Kirill will sign a joint declaration. Patriarch Kirill is due in Cuba for an official visit at the same time as Pope Francis’ stopover in Havana. In a joint statement, the two churches said the meeting would “mark an important stage in relations between the two churches”. Since becoming Pope in 2013, Francis has called for better relations between the different branches of Christianity. The foreign policy chief of the Russian Orthodox Church, Metropolitan Illarion, told reporters that there were still differences between the two churches, but that international events had pushed the leaders to meet. Metropolitan Illarion said: “The situation in the Middle East, in northern and central Africa and in other regions where extremists are perpetrating a genocide of Christians, requires immediate action and an even closer cooperation between Christian churches. The Orthodox Church is made up of more than 10 separate churches. 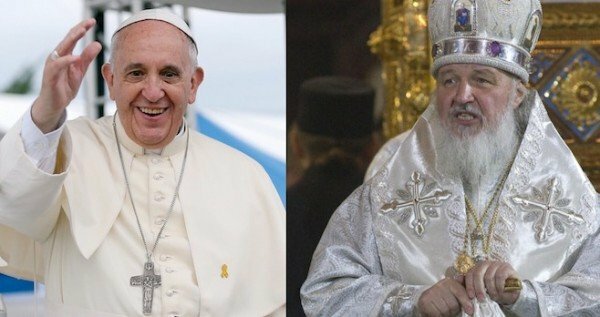 The Vatican has existing ties with the Istanbul-based Ecumenical Patriarch, Bartholomew I, but this will be the first meeting between the Pope and the patriarch of the Russian Church, which is the largest and most powerful Church in Orthodoxy. Pope Francis has welcomed several thousand refugees in St Peter’s Square at the Vatican as the Catholic Church marked a day dedicated to them. He said the refugees carried within themselves “a history, a culture, precious values” and urged them not to give up hope. The refugees – including many asylum seekers – waved their nations’ flags during the address. Europe is struggling to cope with an influx of refugees. Pope Francis has repeatedly called on European states to welcome people fleeing war and poverty. Later the pontiff became only the third pope to visit Rome’s main synagogue. Hundreds of armed police and security personnel were deployed for the occasion. Rome’s chief rabbi, Ricardo Di Segri, has said the visit is considered as a sign of 50 years of improving Jewish-Catholic relations. In December, the Vatican said that the Roman Catholic Church did not support efforts to convert Jews to Christianity. Pope Francis has denounced materialism in his annual Christmas homily. The pontiff has warned the world’s 1.2 billion Roman Catholics not to be “intoxicated” by possessions. Pope Francis called for more sobriety in a world obsessed by “consumerism and hedonism, wealth and extravagance”. The Pope was celebrating a Christmas Eve Mass in St Peter’s Basilica in front of about 10,000 people. On December 25, Pope Francis will deliver his traditional Christmas message from the central balcony of St Peter’s Square. Celebrating Mass, the Pope said Christmas was the time to “once more discover who we are”. He called on believers to show the same simplicity as the child Jesus, “born into poverty in a manger despite his divinity” to inspire their lives. “In a society so often intoxicated by consumerism and hedonism, wealth and extravagance, appearances and narcissism, this child calls us to act soberly, in other words, in a way that is simple, balanced, consistent, capable of seeing and doing what is essential,” he said. Security was tight at the service with police carrying out spot checks in the area surrounding the Vatican. Everyone who went into the basilica, the largest church in Christendom, had to pass through metal detectors. Correspondents say Pope Francis used his homily to reflect the key themes of three years in office – mercy, compassion, empathy and justice. “In a world which all too often is merciless to the sinner and lenient to the sin, we need to cultivate a strong sense of justice, to discern and to do God’s will,” he said. Pope Francis’ voice was occasionally hoarse – the effect of a slight flu earlier this week. A second miracle attributed to Mother Teresa has been recognized by Pope Francis, clearing the way for the Roman Catholic nun to be made a saint in 2016. The miracle involved the inexplicable healing of a Brazilian man with multiple brain tumors, a report in the Avvenire newspaper of the Italian Catholic Bishop’s Conference said. 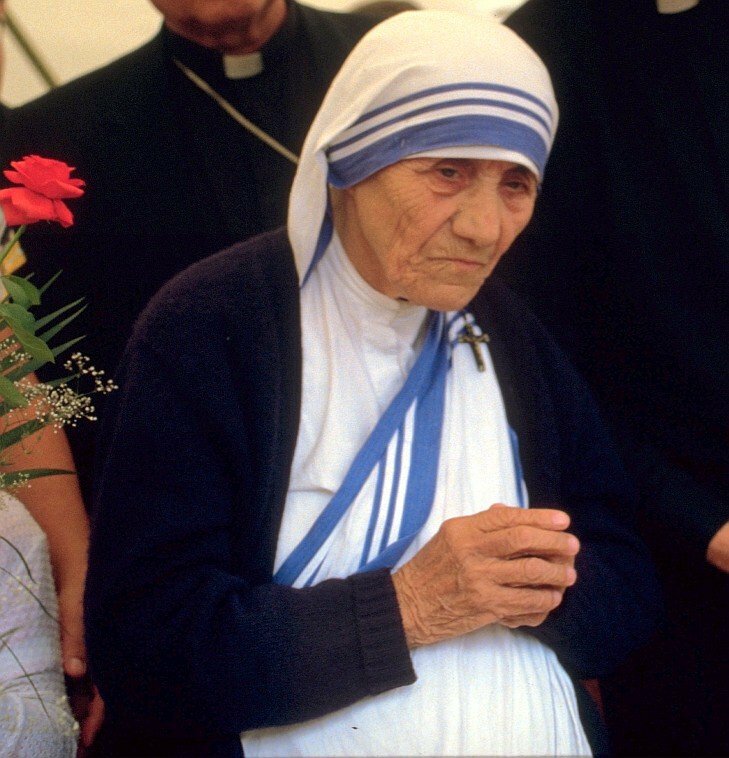 Mother Teresa was beatified – the first step towards sainthood – in 2003. In 1979, she won the Nobel Peace Prize for her work with the poor. Mother Teresa died in Calcutta, India, on September 5, 1997. She is celebrated for her work in the slums of Indian city of Kolkata (Calcutta). The Avvenire report said that she is expected to be canonized in Rome in September. Beatification requires one miracle by the Catholic Church, while the process of becoming recognized as a saint requires proof of at least two miracles. Mother Teresa was beatified in 2003 after Pope John Paul II accepted as authentic a miracle attributed to the nun. Pope John Paul II judged that the curing of an Indian woman suffering from an abdominal tumor was the result of the supernatural intervention of Mother Teresa with God – a claim challenged by Indian rationalists. Born Agnes Gonxhe Bojaxhiu in Uskup (now Skopje), Macedonia, in 1910, Mother Teresa founded the Missionaries of Charity in 1949, dedicating her life to caring for impoverished and sick people in Kolkata. Known as the “saint of the gutter”, she earned worldwide acclaim for her efforts. Mother Teresa and her helpers built homes for orphans, nursing homes for lepers and hospices for the terminally ill in Calcutta. Mother Teresa’s organization also engaged in aid work in other parts of the world. The modest nun became known all over the world, and money poured in. But she was also criticized. It was alleged that dying people in the hospices were refused pain relief, whereas Mother Teresa herself accepted hospital treatment. Mother Teresa also held a conservative view on abortion. She was regarded as a spokesperson for the Vatican. Pope Francis has opened the Holy Door of St Peter’s Basilica in Rome to launch the Catholic Church’s Year of Mercy. Tens of thousands attended a Mass in St Peter’s Square for the start of Pope Francis’ “revolution of tenderness”. The Mass took place amid tight security with extra police and soldiers deployed, and a no-fly zone imposed. Under the year’s theme of mercy, Pope Francis has said priests can absolve women who have had abortions. During the jubilee celebrations, one of the most important events in the Roman Catholic Church, pilgrims travel to Rome and religious sites around the world. 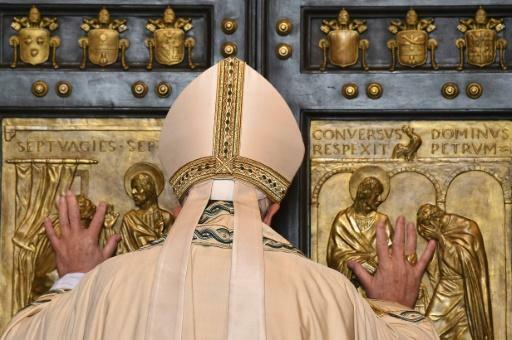 At the end of the Mass, Pope Francis opened the huge bronze Holy Door. He said that by passing through it, Catholics should take on the role of the Good Samaritan. It is the first time the Holy Door has been opened since the Great Jubilee in the 2000 called for by St John Paul II. It has been bricked up since then. Emeritus Pope Benedict XVI, 88, also attended today’s event. Italian security forces are on high alert following recent attacks in Paris and San Bernardino, California. Visitors to St Peter’s Square had to pass through metal detectors and undergo bag and body checks. Announcing the extraordinary jubilee in March, Pope Francis said the Holy Door was a “Door of Mercy, through which anyone who enters will experience the love of God who consoles, pardons and instills hope”. For the first time, the pontiff has instructed churches and cathedrals to take part in the tradition of the Holy Door, to help Catholics mark the jubilee at home rather than coming to Rome. Pope Francis has long signaled his wish to change the Church’s approach from condemnation of wrongdoing to a Church that is more forgiving and understanding of its flock. This extraordinary jubilee year is seen as a practical way of giving expression to that wish. 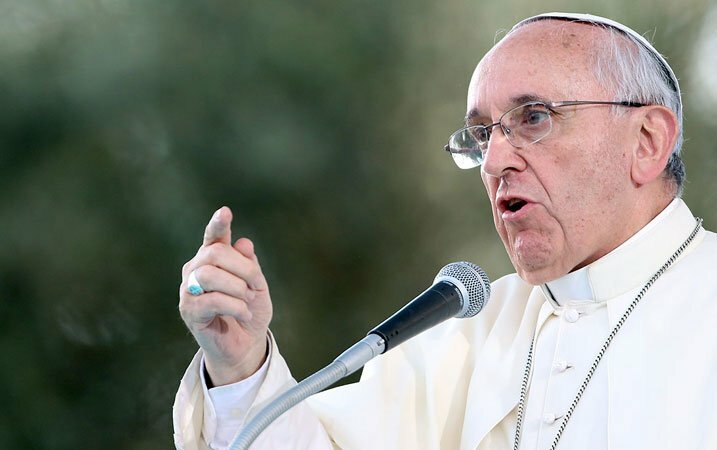 Pope Francis took many by surprise when he announced in September that, as part of the jubilee, parish priests across the world would be allowed to absolve repentant women who asked for forgiveness for having an abortion, even though Church teaching still terms abortion a grave sin. Jubilee years are rooted in the Old Testament tradition of freeing slaves and prisoners once every 50 years, a concept that died out within Judaism but was taken up by Pope Boniface VIII for the Catholic Church in 1300. Pilgrimages to Rome were at the heart of the original jubilee years, and attracted hundreds of thousands of pilgrims to the city, many willing to pay for “indulgences” – the eradication by the Church of the spiritual debt arising from sin. It was a tradition that not only contributed copious cash to the Vatican’s coffers, but also contributed to the theological turmoil that led to the establishment of rival Protestant churches across much of northern Europe. The last Jubilee was called by St John Paul II to mark the millennium, and this Holy Year of Mercy starts on the Feast of the Immaculate Conception on December 8, 2015, and will end on the Feast of Christ the King on November 20, 2016. The Vatican announces it has ordered the first ever external audit of its assets as part of Pope Francis’ efforts to reform the Roman Catholic Church. Accounting giant PricewaterhouseCoopers will start work immediately, a Vatican spokesman said. Pope Francis has promised to make the Vatican’s finances more transparent after a series of scandals. In 2014, the pontiff created a new ministry to oversee papal finances, headed by Cardinal George Pell. Cardinal George Pell later said he had discovered millions of euros “tucked away”. While he did not say any wrongdoing had occurred, he added Vatican departments long had “an almost free hand” with their finances. Turning to an external auditor puts the Vatican more in line with international standards. PwC will review the Vatican’s consolidated financial statements, spokesman Federico Lombardi said, which includes assets, income and expenses. Author Gianluigi Nuzzi obtained secret recordings of Pope Francis this year suggesting the pontiff had grown exasperated at vested interests in the Vatican. “If we don’t know how to look after money, which you can see, how can we look after the souls of the faithful, which you can’t see?” Pope Francis told clerics in 2013, the recordings said. 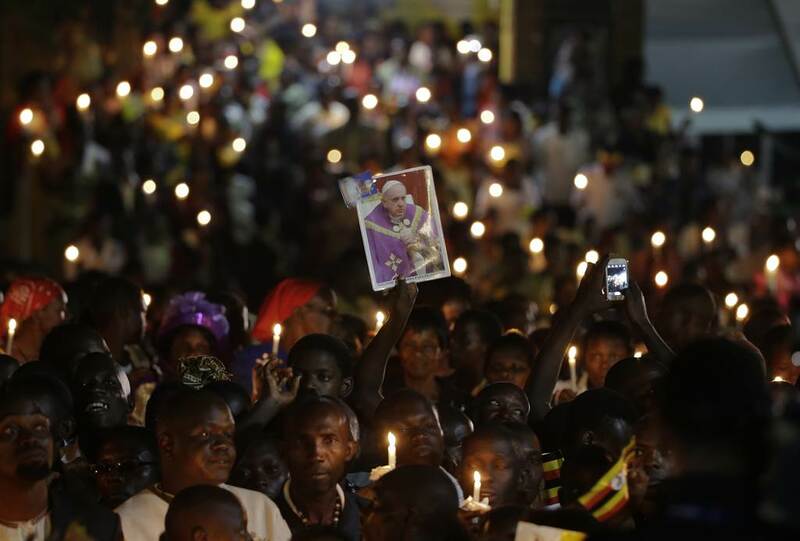 Hundreds of thousands of pilgrims are attending a Mass celebrated by Pope Francis in Uganda. Pope Francis is speaking at a Catholic shrine dedicated to Christians martyred for their faith in the 19th Century, on the second stage of his three-country trip to Africa. The Mass marks the 50th anniversary of the martyrs’ canonization. There were huge cheers as Pope Francis began the open-air ceremony at Namugongo, near Kampala. It was there where many of the 45 Anglican and Catholic martyrs were burned alive. The martyr’s execution was ordered by a king worried about the spread of Christianity. Thousands of pilgrims braved rain to spend the night holding a vigil near the martyrs’ shrines and there were long lines of pilgrims still trying to access the shrine as Pope Francis began to address the crowds on Saturday morning. Uganda is a deeply religious country, with over 14.1 million Catholics – and even adherents of other faiths will be paying close attention to the Pope’s words, say correspondents. Pope Francis arrives in Uganda during the third week of a presidential campaign being fought by the country’s ruler for the past 29 years, President Yoweri Museveni. Francis is the third Pope to visit Uganda, and he is likely to continue to preach his message of mercy and care for the poor, and to speak out against corruption – a message that was welcomed by people in Kenya. The pontiff may also talk of the need for reconciliation amongst different tribes and, perhaps, pray for a peaceful vote here in February 2016. However, there were critical references to the Pope’s visit on Twitter – with some wondering “how many people have HIV today because contraception isn’t allowed?” while others accused him of ignoring extreme anti-gay attitudes in Uganda. Pope Francis will travel to the Central African Republic (CAR), which has been hit by serious violence between Christian and Muslim militias in recent years, on November 29. Five people, including two journalists, who are accused of leaking and publishing Vatican secret documents revealing mismanagement in the Holy See, are set to go on trial. The journalists, Emiliano Fittipaldi and Gianluigi Nuzzi, who cited the documents in two books will face the tribunal, along with two members of a papal commission and an assistant. If convicted, they could be jailed for up to eight years. Media groups have condemned the trial. One of the journalists charged called it “an attack on press freedom”. Emiliano Fittipaldi and Gianluigi Nuzzi carried allegations of the misuse of charitable and other funds in their books Merchants in the Temple and Avarice. The allegations included the lavish refurbishment of apartments for cardinals and others. The three accused of leaking the documents are a Spanish priest and an Italian public relations expert who sat on a commission which advised the Pope on economic reform, along with the priest’s secretary. Media groups have urged the Vatican to drop the charges. The journalists involved called the trial “Kafka-esque”, saying neither they or their lawyers had seen details of the charges. The three accused of leaking the documents are Monsignor Angelo Lucio Vallejo Balda and his assistant Nicola Maio, along with PR expert Francesca Chaouqui. The special reform commission they were serving was set up by Pope Francis to tackle the Vatican’s financial holdings and propose reforms to improve cash flow to the poor.